SBIR Grantee’s Response to Killer Beetles: SPLAT! The Small Business Innovation Research (SBIR) program at USDA offers competitively awarded grants to qualified small businesses to support high quality, advanced concepts research related to important scientific problems and opportunities in agriculture that could lead to significant public benefits. The National Institute of Food and Agriculture (NIFA) administers SBIR Phase I grants that are limited to $100,000 and a duration of 8 months, and Phase II grants of up to $500,000 and 24 months that are open only to Phase I awardees. Below is the first-hand account of NIFA-funded SBIR research from Agenor Mafra-Neto, President and CEO of ISCA Technologies, Inc. It might sound like the subject of the lamest B-horror flick ever made, but for pine trees in western North America, it’s a true story—the plant world’s equivalent of a zombie plague that has destroyed an estimated 723 million cubic of timber on more than 17.5 million hectares of forested land. All on account of a tiny mountain pine beetle (MPB), no larger than a single grain of rice. A single beetle, usually female, can establish a complex biochemical chain reaction of behavior-modifying substances called semiochemicals that can trigger a coordinated attack on a tree by a veritable beetle hoard. The attacking beetles bore networks of tunnels under the bark where they breed and lay their eggs and, quite literally, eat the tree from the inside out. Nothing can be done to save the tree once it reaches this stage of infestation; the beetles have fatally disrupted its water and nutrient supply, causing it to starve to death. But now there’s hope. ISCA Technologies, a biotechnology firm based in Southern California, has introduced a new pest control product that targets MPB: SPLAT Verb (Specialized Pheromone & Lure Application Technology). NIFA supported the research with a $450,000 Small Business Innovation Research Phase II grant. This ecological tragedy is playing out across the continent on a scale never before seen in human history. 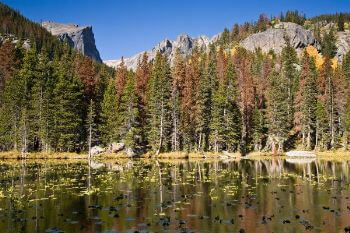 Mountain pine beetles (MPB) and other bark beetles have created swaths of dead-crowned zombie trees from Southern California and New Mexico up into the Yukon Territory of Canada. Timber industry losses have been staggering: roughly half that region’s marketable pine. In addition to direct losses, bark beetles also threaten real estate values, tourism, and recreational activities—and create ideal conditions for wildfires by creating a plentiful supply of dead, dried-out kindling. SPLAT Verb is a semiochemical-based repellent that turns one of MPB’s most formidable weapons against it—its sensitivity and responsiveness to chemical cues in its environment, especially during selection of a suitable host tree. The biochemical processes that mediate mass attack behavior in bark beetles are complex and multifaceted. One compound that has great potential for controlling the pest is verbenone, an anti-aggregation pheromone and the active ingredient for which SPLAT Verb is named. For bark beetles, the scent of verbenone hanging around a pine tree is as good as a sign flashing “NO VACANCY” in bright neon letters. SPLAT Verb presents as an organic waxy matrix with a consistency between toothpaste and liquid cement that acts as a controlled release system. This product dispenses the active ingredient into the environment at high enough rate to divert MPB away from treated trees. Throughout a two-year USDA-funded research project, SPLAT Verb consistently achieved a 100 percent rate of protection when applied to individual lodgepole pines, even when bark beetle infestation rates were shown to be high. For example, in a 2012–2013 study, 28 out of 30 untreated control trees fell victim to the beetle plague, whereas all SPLAT Verb-treated trees within the same vicinity remained healthy and uninfested a full year after treatment. In addition, these studies showed that SPLAT Verb can produce a protective “halo effect” that repels MPB from the trees up to 11 meters from the one it was directly applied. SPLAT Verb was registered as an organic repellent for MPB in 2012, and has since been applied in nine states. A related product, SPLAT Verb+, is currently under development, attempting to enhance the repellent capacity of verbenone with a blend of volatile compounds, in the hope of driving off another species of bark beetle, Dendroctonus brevicomis, the western pine beetle. The results of these studies are an encouraging sign that it’s possible to protect vulnerable pines from bark beetles under field conditions using pheromone-based, insecticide-free methods—a particularly valuable advantage for any pest-management product intended for use in sensitive forest ecosystems. With further work, pheromone-based products like SPLAT Verb could form an important part of the management solutions to one of the greatest threats to the health of North American forests.